BJP leader and former Delhi Minister Harcharan Singh Balli made a personal appearance in the Supreme Court today in view of its notice of contempt against him for breaking the seals of some shops in Tilak Nagar area during the MCD drive to close the illegal shops in residential areas. The Students’ Islamic Movement of India (SIMI) may be given a “clean chit” as part of political tactics, but at practical level, the dragnet around SIMI is reportedly being tightened in all districts of UP. It is more so following the latest serial bomb attacks by terrorists in Mumbai suburban trains on Tuesday last. With the regulations against ragging, senior students on the first day of the new academic session remained content with making the freshers gyrate to popular numbers or count backwards in Hindi. Hundreds of students who have been denied admission in government-run schools are living testimonies to an apathetic administration that has failed to protect their right to education. The School of Planning and Architecture signed a significant MoU with Guru Gobind Singh Indraprastha University on Monday for starting a rather unusual course, an MBA programme in real estate development, which will run only on weekends. The Expenditure Finance Committee (EFC) of the Government of Delhi has given its nod to three projects, one of the Law Department and two of the PWD. In a move aimed at bringing down the pollution levels in the Capital, the Delhi Cabinet today decided that all two-stroke three-wheelers that were older than 10 years would have to convert to four stroke. The Capital today witnessed lights rain, thus breaking the lull in rainfall activity in Delhi and slightly bringing down the mercury. The body of 47-year-old A. J. Anthony, a Section Officer with the Army Headquarters here, was today found in the New Minto Road Hostel Block II on the premises of the dispensary there. The body has been sent for a post-mortem examination. Keeping in mind the increasing incidents of thefts, robberies and even murders involving domestic servants, the district administration has directed all persons having servants at their residence to get their antecedents verified by the police within 10 days. Delhi Chief Minister Sheila Dikshit today inaugurated the Sadbhawana Kanwaria Camp at Jafrabad in East Delhi. Terming the camp as a unique and excellent example of Hindu-Muslim unity and cultural synthesis, she stressed that such camps should be organised in other areas of the Capital as well. The Social Welfare Department of the Delhi Government has adopted a strategy of building ‘preventive awareness’ and effecting the recovery of addicts through medical treatment and counselling, said Social Welfare Minister Yogananad Shastri at a seminar, “ Drug Abuse : Youth and Children”. To a specific query by a Bench of Chief Justice Y K Sabharwal and Mr Justice C K Thakker as what actually he had done, Balli denied having even gone to Tilak Nagar on April 1 when he allegedly had broken the seal in full glare of TV cameras. He claimed that no sealing operation had taken place in Tilak Nagar on April 1 as it was confined only to Kirti Nagar and Subhash Nagar on that day. He was arrested on April 3 and sent to 14 days’ judicial custody and was not aware as what had happened thereafter, the BJP leader in his personal submission said. Contempt notice was issued to him after the report of a monitoring committee set up to supervise the sealing operation, alleging that he had broken the seal and some TV channels had recorded the incident. The court on his request ordered him to provide all relevant documents and the cassettes of the video recording to prepare his defence, while posting further hearing for the first week of August. The court also directed the MCD to submit names of its five officials, including a superintending engineer against whom complaints of “malpractice” in the sealing operation was filed by the monitoring committee accusing them of carrying the sealing in a selective manner and allowing tampering with the seals. Their names had been sought by the court on monitoring committee’s report for initiating contempt action against them. The names of some SIMI activists are being linked with this latest anti-humanity attack on civil society. Police and secret agencies in each UP district are understood to be verifying and scanning records of the suspected terrorists and SIMI activities. Details of telephone, cell phones and cyber café are being collected. According to sources, no instruction has been issued by any functionary of the state government for any action against the members of the SIMI the students Islamic Movement of India SIMI. But government agencies have been asked to analyse and assess the past actions of people connected with SIMI and also to keep a tab on the current activities of its members in Ghaziabad, Mow, Baraich, Gorakhpur, Sidharth Nagar, Azam Garh, Gonda, Faizabad, Rampur, Muradabad, Shahajanpur, Bhadohi, Varanasi, Saharanpur, Muzzafar Nagar, besides Lucknow. Investigations into the activities of dozens of people connected with SIMI in Muradabad, and their activities and links in Delhi, Mumbai, as well as on their hideouts have already been under way. The detailed data of those frequently visiting Delhi and Mumbai as well as those having frequent telephonic talks is being collected and collated. Such inputs are also being obtained regarding activists based in Barielly, identifying and nabbing them though police circles maintain that nobody in Barielly is linked with Simi. But Dy. Inspector General Police, Chhavi Nath Singh has instructed the police and local intelligence units to keep tabs on the activists in Shahjahanpur and SO D.K. Singh of Miranpur Katra police station has been instructed to conduct raids for arresting Kalam Packer, Mohd Aaasif Khan, Mohd Veseem Khan, Mujahid Hussain, etc. But so far none of them has been nabbed. The reports of SIMI’s activities in eastern UP district especially those bordering Nepal have made the intelligence agencies lose their sleep. They are now concentrating on people who have a record of being linked with such activities. The records of past five years pertaining to telephones, cell phones calla and the Internet are being scrutinized. The SIMI activities of Gorakhpur Zone are also being examined. In eastern UP, SIMI network is reported to be well established in Azamgarh and surrounding areas. SIMI’s national president Shahid Badr Fallahi also hails from Manchoma village of Azamgarh. He has reportedly gone underground for a couple of months. The number of SIMI’s supporters in and around Azam Garh runs into hundreds. Shahganj of Jaunpur and Kheta Serai are also considered strongholds of SIMI. Police and intelligence agencies are also investigating if SIMI has recently changed its nomenclature. As ragging is banned at Delhi University, students have limited the exercise of breaking the ice to plain “interaction”. While most of the freshers confessed that they hoped the “ragging bit wouldn’t get out of hand”, they were, however, not averse to “interacting” with the seniors. “I don’t mind getting ragged just a bit, I can sing and dance, but anything beyond that would not be welcome,” said Rati, a student outside Miranda House. Some were even “looking forward to having fun with seniors”. But senior students, amply cautioned by the college administrations, were happy not “to rag”. Some colleges, including Hindu, have put up anti-ragging posters and have also formed anti-ragging squads to prevent any untoward incident. “We know the repercussions of being caught ragging. We don’t want to get thrown out of college for momentary fun. In any case, even those who want to rag know that during the initial few days there is heightened vigilance so even they have to wait for the fuss to die down,” said a group of students in Hindu, who were carrying out the “customary interaction” near the “virgin tree”. The university having spelt strict action against those found ragging, the scene in most colleges was similar. With come colleges having installed CCTVs following the university’s directions, even “interaction” was being carried out under the watchful gaze of the authorities. “We know the college authorities are watching us…we have CCTVs in the college. So we are careful not to cross the line,” said students in Kirori Mal College. University authorities on their part kept a strict vigil. 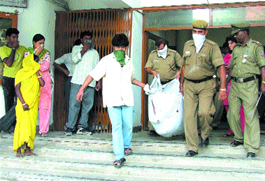 Police pickets and anti-ragging squads could be seen in all colleges. Hira Devi, mother of three children, narrates, “For the past three years I have been trying to get my daughters admitted to the nearby government schools but have not succeeded. They said they needed documents. When I approached them with the required documents they said there were no seats available. This has been a routine affair for the past three years”. Taking up the cases of Krishnender Singh and Hira Devi and scores of others with similar complaints, the Right to Education Task Force (RETF), a unit of Social Jurist, will file a public interest litigation to seek justice for them. More than 100 parents and children from various parts of Delhi poured in to share their woes at the camp organised by the RETF here on Sunday. Parents came from as far as Bhalaswa village, Shahadara, Yamuna Bazaar, Badarpur and Bodolbundh. The RETF has registered more than 81 individual complaints of denial of admission to schools. “These children were denied admission on various grounds, varying from unavailability of seats, to lack of proper transfer certificates and inability of the parents to pay the fee of Rs 22,” the RETF pointed out. It was further mentioned that children who had studied in unaffiliated schools, children who were associated with the Sarva Shiksha Abhiyan (SSA), those who had failed their class X and those who had come from English medium, National Open School were also denied admission. “The children have a fundamental and human right to education as guaranteed under Articles 21 and 21-A of the Constitution of India and therefore the government schools cannot deny admission on any pretext. The fact is that the demand for education has tremendously increased but the government has failed on the supply side. The government is required to double the schools to meet the present demand”, said Mr Ashok Agarwal of the Social Jurist. Dr Kuldip Chandra, Head of the Building Engineering and Management Department, says that “there is nothing organised in this field (real estate development) and most people working in it are untrained and as a result many mistakes and even mishaps occur. For instance, people in this field do not have a professional idea of building engineering, land use and development etc. The Law Department has to construct an integrated complex for the Delhi Judicial Academy, the National Law School and the National Institute for Mediation and Conciliation at Dwarka. The projects were sanctioned at a meeting of the EFC chaired by Delhi Finance and Planning Minister A. K. Walia at the Delhi Secretariat. Dr Walia while briefing the media after the meeting said the EFC had sanctioned a proposal of the Law Department for construction of an integrated complex with an estimate cost of Rs 108 crore at Dwarka, Sector 14. The construction would be completed within 42 months after award of work. An integrated complex comprising an institutional building as per the design finalised would be constructed at Dwarka on a site measuring 12.19 acres allotted by the DDA. It would also house a National Law School on the lines of existing National Law School, Bangalore, and an academy for in-service judicial officers training in Delhi. The integrated complex is being constructed to meet out the overgrowing demand for judicial infrastructure with a view to provide justice to the people at large. The EFC has sanctioned an amount of Rs 4.95 crore for strengthening of Outer Ring Road No 26 from Madhuban Chowk to Mangolpuri Chowk. The work would be completed within four months after start of the work. Another proposal relating to improvement of Road No 43 from RD 2840m to 5290m and Road No 42 from RD 30m to 1220m has also been cleared by the EFC. The road would be strengthened with an estimated cost of Rs 1.21 crore within seven months. The three-wheelers or autorickshaws that had already converted from diesel to CNG would be given Rs 6,000 as subsidy by the NCT Government to change to four stroke, Transport Minister Haroon Yusuf said. The total cost of conversion to four stroke would be around Rs 15,000. Mr Yusuf said the manufacturers had agreed to give a 6 per cent concession to the autorickshaw owners. “The reason behind the decision is that we want to bring down the pollution levels in Delhi,” he said. “Three-wheelers that are less than 10 years’ old can also voluntarily switch over to four stroke and avail of the government subsidy,” Mr Yusuf said. The autos could continue with the old electronic meters after conversion to four stroke, Mr Yusuf said. In all, there are 55,000 three-wheelers running on CNG in the Capital, of which around 15,000 are two-stroke vehicles. The showers, which began at around 1400 hours, led to a drop in maximum temperature to 34.8 degree Celsius, from 36 degrees C yesterday. Though the showers lasted for a brief while, they nevertheless brought cheers on the faces of the people of Delhi, who have been witnessing a dry spell after the initial burst of monsoon rains last week, following the arrival of the South West Monsoon in the Capital last Sunday. Around 2.4 mm of rainfall was recorded till 1730 hours, the weather office said. The coming week could bring more rains to Delhi with the weathermen forecasting an increase in rainfall activity in North-West India during the next few days. Weathermen said the well-marked low pressure area over Jharkhand and adjoining north Orissa which led to fairly widespread rains over Jharkhand, Orissa, Chhattisgarh and East Madhya Pradesh in the last few days, is likely to move in a west-northwesterly direction in the next few days. Consequently, while rainfall activity over Jharkhand and Orissa is likely to decrease after 24 hours, it could increase in East Rajasthan and areas of North-West India, including Delhi. The rainfall notwithstanding, a by and large sultry weather was witnessed in Delhi with the humidity being at a high level of 66 percent. The weathermen have forecast a generally cloudy sky with rains and thundershowers likely in some areas during the next 24 hours. According to the police, Anthony, who used to live on the ninth floor of the building, had reportedly committed suicide. He was staying alone here while his family was in Kochi. The police believe that the man may have committed suicide by jumping from the ninth floor on Friday night and the body was discovered only this morning as the dispensary is closed on Saturdays and Sundays. The police said that no suicide note was found but all other items, including his identity card, were found intact. The police said that further inquiries were being made to ascertain the cause. No one is reported to have seen or heard the man jump to his death even though the body pierced through the first floor canopy. Exercising the powers vested in him by virtue of Section 144 of the Code of Criminal Procedure, 1973, the District Magistrate, Mr R. P. Bhardwaj, directed that details of all servants along with their home addresses and attested photos should be submitted to the respective police stations within 10 days so that their antecedents and home addresses could be verified by the police department. Mr Bhardwaj informed that it had become imperative to issue orders ex parte as it was not possible to issue notices to all such persons. The DM clarified certain crimes were committed by domestic servants or private servants. In many cases, the persons employed as domestic servants were from out of the state and their correct addresses and their antecedents were not known either to the employer or the local police, thereby hampering the investigation into the crimes. Thus, it was of utmost importance that the correct addresses of persons employed as domestic servants were available with the employer as well as with the police so that in the eventuality of a crime the culprits could be traced, opined the DM. The Senior Superintendent of Police, Mr Hanif Qureshi, informed that police had tried many times to get all servants verified by the police department. But it was observed that the masses did not come forward to take the initiative and get their servants verified by the police. This present exercise must be taken seriously by the public so that crime could be checked more effectively, added the SSP. Delhi Chief Minister Sheila Dikshit today inaugurated the Sadbhawana Kanwaria Camp at Jafrabad in East Delhi. Terming the camp as a unique and excellent example of Hindu-Muslim unity and cultural synthesis, she stressed that such camps should be organised in other areas of the Capital as well. This would go a long way in establishing amity and social harmony. Local MLA Chaudhary Mateen Ahmed and councillor Zamir Ahmed Munna were also present on the occasion. The Chief Minister said that this Sadbhawana Camp at Jafrabad had established an identity of its own owing to the fact that Hindu Kanwarias going to Hardwar were looked after and served by people from the Muslim community at this camp. She termed the camp, which was being organised since the past 13 years, as an example for the people of the rest of the country. He said as per a survey conducted by the Union Government with the help of the United Nations Office on Drugs and Crime the prevalence of drug use was common among children in the 12-18 year age group. They generally took cannabis and opiates. Children of urban areas indulged in this habit. Now, it had proliferated to the suburbs and rural areas. According to the ‘World Drug Report’ prepared by the United Nations Office on Drugs and Crime, India has 25 million drug users. The country at present had two million opium users, 8.7 million cannabis addicts and 62.5 million alcohol users, the report said. Dr Shastri said the department had taken measures like dissemination of information on various issues relating to drug abuse prevention through various media, electronic and print media, and assisting voluntary organisations for running awareness programmes. The government had taken steps to curb drug trafficking in the Capital, including the sale of drugs in the vicinity of any school or educational institution, he further added. He said the students at the secondary and senior secondary level were vulnerable to slipping into drug abusing behaviour due to stress. It was felt that educating them on the ill-effects of drug abuse through appropriate inputs in the school curricula could help reduce the element of risk of succumbing to this vice. The woman, who was inadvertently identified as an HIV positive patient in the photograph carried in these columns on Sunday, is in fact a social worker who had come to highlight the cause of those afflicted along with Bollywood stars Kunal Kapoor and Neha Dhupia.